Updates to KeeneticOS are released on a regular basis, our research and development team are constantly working to make the Keenetic router's operating system faster, more functional and safety-concerned. We recommend using the latest release version available for your Keenetic router. NOTE: Important! 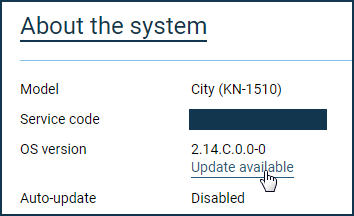 To be able to update to the latest release of the KeeneticOS online, it is required that the router has established Internet connection link first. On the 'System dashboard' start page of your router's Web Control Panel, in the 'About the system' info box, look for the 'OS version'. Operating system automatically checks for the availability of the new releases. When the server has a newer version than the one that is already running on the device, you will see the 'Update available' status under the 'OS version' line. 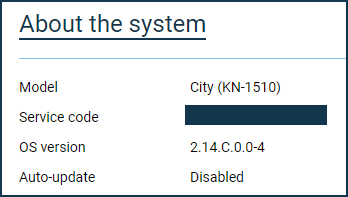 TIP: Note: Some models, namely Keenetic City (KN-1510), Air (KN-1610), Lite (KN-1310) are flashing the FN LED indicator on the front panel of the router case when an update availability is detected. That is the default behaviour for this indicator, and it can be changed manually to flash FN LED for a different event. Click the 'Update available' link. An 'Updates and Component Options' section of the 'Management' menu will open. Click on the 'Install the update' button to start the process of updating the operating system. An information dialog will appear with the message 'The device will reboot after installing the updates'. Please click 'Confirm' button. NOTE: Important! During the upgrade process, do not turn off the device, nor disconnect it from the Internet. 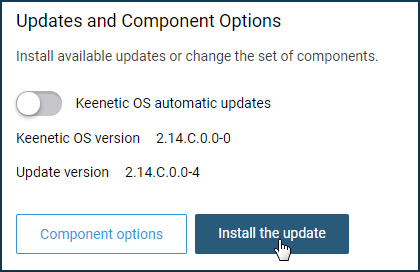 Upon the completion of the OS update process, the Keenetic will restart automatically and then be ready for use again. Update availability status will change to 'The latest updates are already installed'.